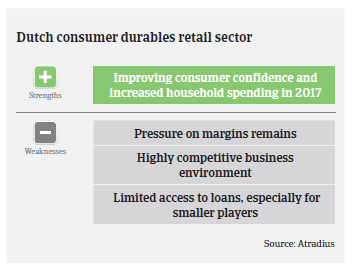 In 2016 the Dutch consumer durables retail sector continued to benefit from the continued rebound of the domestic economy. According to the Dutch Statistics Office CBS, turnover in the non-food retail segment increased 1.9% in 2016, while online sales turnover even increased 19%. In 2017, the non-food retail segment is expected to grow further, by about 1.5%-2.0%. Along subsectors, clothing/footwear sales are expected to level off, while the volume of offline sales of electronic devices is expected to decrease by about 2%. Furniture retail and DIY retailers’ volume growth is forecast to increase 3%, driven by the continued rebound of the Dutch real estate sector. 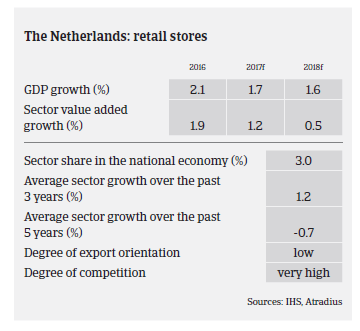 However, the economic rebound, increased consumer confidence and sales growth do not translate into an untroubled positive outlook for Dutch non-food retailers, as the business environment remains difficult. Total sales generated in 2016 were still more than 10% below 2008 pre-crisis levels. As a legacy of the previous economic crisis, Dutch consumers remain very price sensitive and they have become accustomed to sales offers and discounts, which negatively affects sales prices. Consumers increasingly demand longer opening hours in order to shop whenever it suits them. Changing demographics, i.e. the aging population (in 2025 the share of people aged 65 or older is expected to be more than 20%) is also increasingly playing a role. At the same time, consumers’ buying behaviour keeps changing due to the increased offerings from international companies (e.g. Primark and Zara) and technological advances. Online sales are rapidly growing (2017 forecast: up 17%) at the expense of brick-and-mortar retailers, with foreign online retailers like Alibaba increasing their market share at the expense of local businesses. Competition is high in all segments and the subsequent price pressure offsets sales volume growth, meaning that the already low profit margins of many businesses will remain under pressure. At the same time, many retailers are highly geared and dependent on bank loans, but access to bank credit remains limited for many companies, especially traditional brick-and-mortar retailers. According to CBS, in 2016 business insolvencies in the retail segment decreased 15%, to 952 cases (including 449 wholesalers and 425 retailers). Compared to other industries, this sector has the highest number of business failures. A far more modest decline in retail insolvencies is expected in 2017, probably in line with the general business insolvency forecast for Dutch companies (down 3%). However, since not all businesses are willing or able to adapt to an increasingly difficult business environment, rapidly changing market conditions and changing shopping behaviour, non-food retail insolvencies are expected to increase again in late 2017 and 2018. This could mainly affect smaller retailers, who often lack the required financial strength to make necessary investments. The failure of a long-established retailer like V&D shows how even large businesses can face troubles due to the lack of a clear product segmentation and a successful online sales strategy. For non-food retailers, a combination of clear product segmentation and positioning, coupled with effective online sales channels and the ability to swiftly adapt to market changes are of major importance in order to generate success - or even to just survive. While the increase in size and market power that acquisitions provide are usually an indicator of business success, some recent examples of Dutch failures show that take-overs can prove to be the wrong strategy in a rapidly changing market environment, especially if there are insufficient financial resources available for necessary adjustments. The mere existence of online sales channels does not per se guarantee any business success: we have observed cases in which businesses experienced difficulties because of improper implementation and maintenance of online channels, e.g. lack of social media activities, outdated websites or websites not working properly on smartphones (80% of Dutch people own a smartphone). 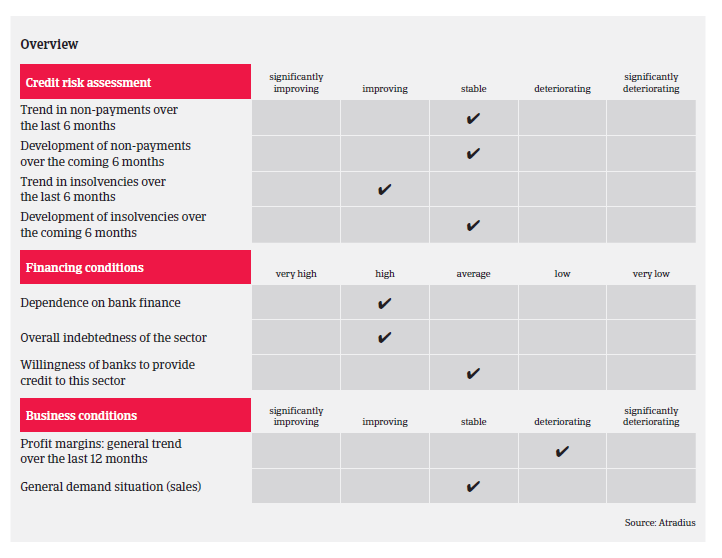 Our underwriting stance remains principally cautious, given the current and future challenges for the sector. However, due to a rebound in recent years and further growth expected in 2017 we have upgraded the performance outlook from “Poor” to “Fair” for the time being. When underwriting the industry close attention is paid to businesses´ turnover and margin development as well as their product positioning/segmentation and their ability to sell online. Retailers’ location and opening hours are also taken into consideration when underwriting the business. It is of major importance to check whether a company’s liquidity position is sound (cash and credit facility) and if it is able to finance investments through cash flow as opposed to additional borrowing.